I don’t remember eating cranberries before and this week I’ve had them twice! Normally, in this country anyway, cranberries are only ever seen in a jar of sticky sweet sauce which usually goes with turkey. As I haven’t eaten turkey for well over 20 years, I don’t think I’ve had cranberries in that time either. I did have cranberry vodka a few times when i lived in Russia but I don’t suppose that counts. Both of the ways I ate cranberries this week are test recipes. 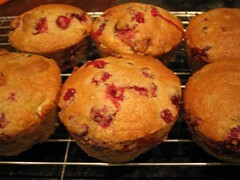 The first one is cranberry, orange and pecan muffins from Vegan Brunch (formerly called Crack of Noon). These suited me down to the ground as you probably know by now that I don’t care for sweet foods and these are nicely sharp, yet balanced with sugar and orange. I’ve also been lucky enough to be asked to test for another new cookbook – I don’t think I’m allowed to say who for yet – and I think a lot of my cooking will be tests for that bok in the near future! The first one I chose to test was a cranberry chilli. The picture doesn’t do it justice at all but it was very tasty, nicely sour with a kick of tequila and chilli in it. 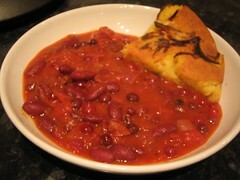 I served it with Veganomicon cornbread. Cranberries must surely be healthy; they were certainly tasty in both of these extremely different recipes! Shame we only ever get them here for a few weeks over Christmas! This entry was posted in 500 Vegan Recipes, Crack of Noon, Veganomicon and tagged Vegan brunch; by efcliz. Bookmark the permalink.